In keeping with my part-old-school-bistro, part-northern-Italian-home kitchen fixation, I've become obsessed with copper cookware. I'm the first to tell you that I'm no accomplished cook, and part of me feels like I have no business cooking with such great stuff. 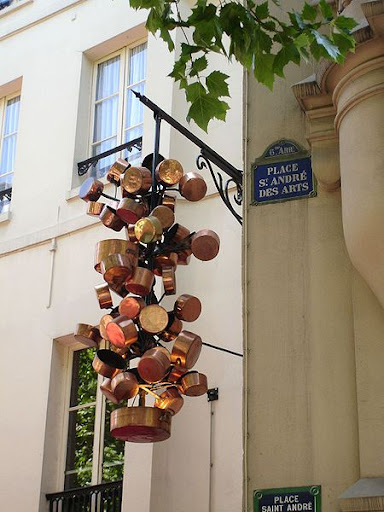 Left: Copper pots hung on the Place St André des Arts, Paris VIe, France, by Julie Kertezs. 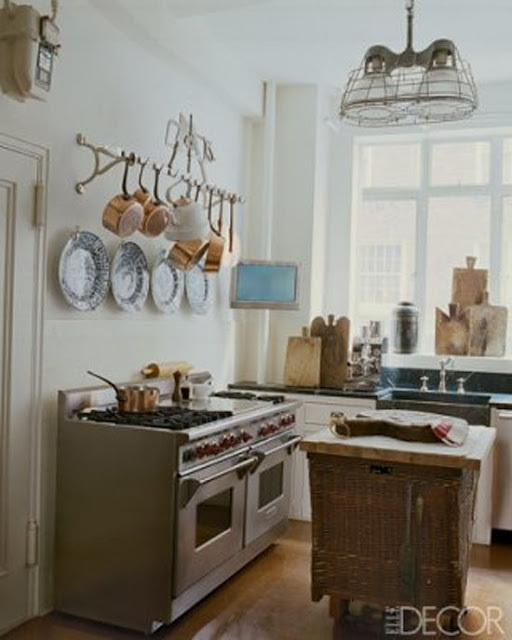 Right: Julia Child's kitchen, via the Smithsonian. But good-quality copper pots and pans are the kind of thing that never go out of style, and which even the dilettante cook can grow into over years and years. Plus, enough of my baking exploits utilize the stove (pastry creams and frostings and such) that I'm grateful for a set of really good saucepans. I've mentioned my beloved copper bowl before, the one that's made buttercreams so much easier - that was my first copper purchase. The rest I've found on Craigslist (one woman sold me her entire 20-piece collection, including a $400 Bourgeat pan, for $150!) and eBay. Though it's possible to spend two grand on a new set of good copper cookware, if you arm yourself with some knowledge, you can outfit your kitchen forty dollars at a time. Chowhound forums have been my best tool for learning about copper cookware. If I run across a brand on eBay that I've never heard of before, Chowhound users have often already answered all my questions about it. The first few thing I learned about copper cookware is that it should be heavy. Copper is an excellent conductor of heat, but in order to properly hold heat and transmit it to food, the copper needs to be fairly thick - ideally at least 2 millimeters thick, although thicknesses vary from less that 1 millimeter to more than 3. This thickness translates to very heavy pots and pans. A simple rule of thumb is that a good copper pan should be about as heavy as its cast-iron counterpart. My 8" Bourgeat saucepan, for instance, weighs nearly six pounds. If you can find out the weight of a piece of cookware you're thinking of buying (most eBay sellers will weigh an item for you), it might be helpful to compare its weight to that of a similarly-sized piece of Falk cookware (one of the only companies who publishes weights alongside item descriptions). Judging by weight alone, however, can be misleading, as many copper pans have heavy brass or cast-iron handles that add significant weight to a piece. The best way to determine thickness is by using calipers, aiming for that magic threshold of 2 millimeters. 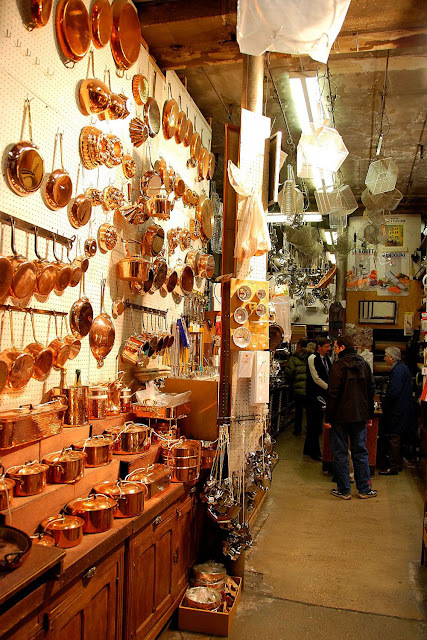 However, since many of us will likely do our buying online, at sites like eBay, here are some rules of thumb to keep in mind when searching for copper cookware. The country of origin: French (Bourgeat, Mauviel, Dehillerin) and Belgian (Falk) copper cookware are generally regarded as higher-quality than that of other countries. Lots of copper pans are manufactured in Korea and Portugal, and these items tend to be thinner and lighter than their French and Belgian counterparts. Ruffoni, an Italian brand, is also known for its quality, but not much copper cookware comes out of Italy in general. Villedieu is a French town known for its copperware - the word "Villedieu" on a pot or pan is generally a good sign. Many of the copper pots and pans you run across will have no brand names engraved on them, but will show the country of origin. Though the words "Made in France" don't necessarily mean you're getting a good pot, it's generally a good sign. American companies also imported copper cookware, particularly in the late 19th and early 20th centuries, and stamped the pieces with their own brand names. Therefore, although America isn't known for great copper cookware, a piece marked "NY" might be a really heavy piece of French cookware. The shape of the rim: As I've mentioned, copper cookware should be very thick. Heavy-duty copper cookware will rarely have a rolled edge, as the sides are simply too thick to finish in such a way. Instead, the rim should have a cut edge, or a flared lip. The material of the handle: The type of metal used for the pan's handle is sometimes shorthand for the pan's weight and quality. Cast iron handles, which are generally very thick and heavy, and which spread out across a greater surface area of the pot, may indicate that a pot is heavy. Brass handles, which are generally thinner, may signal a lighter pot. The French company Mauviel, for instance, sells several product lines. One is lighter-weight, for home cooks, and features brass handles; it is considered by many to be too thin to offer an advantage over other cookware. Mauviel's thick, heavy, professional line, on the other hand, has cast-iron handles. Handles should always be riveted to the pot or pan, with the rivets showing inside the pan and outside, on the handles. Three rivets are better than two. The material of the lining: This is more a matter of personal preference than an indicator of quality. Copper, a reactive metal, reacts to some ingredients, and can taint food. Thus, copper is always lined with a less reactive metal. 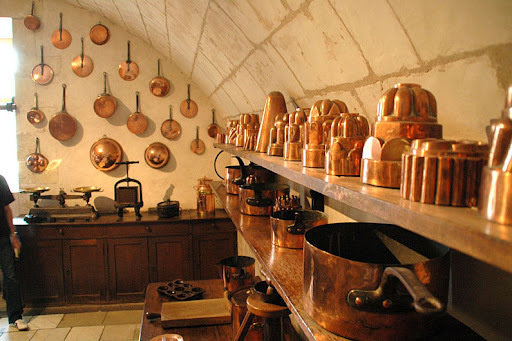 Historically, copper pots and pans have been lined with tin, which transmits heat well. The downside of tin is that it gradually wears away, and tinned copper cookware must be "re-tinned" when copper starts to show through the lining. Stainless steel, on the other hand, has been much less widely used, because it is not as efficient for heat conduction. However, stainless steel is much more durable than tin. Most copper cookware you find on eBay and at estate sales is lined with tin. Tin lining requires that you use only plastic and wooden utensils, and that you never overheat the pot, as tin will begin to melt around 450-500 degrees F. Retinning is expensive. However, a well-cared for tin lining may last many years. Readers in the northeast are lucky, as many retinning companies are located in New York and New Jersey; the rest of us will have to ship our pans when the time comes to re-tin. Some forums note that saucepans, which get lots of action from metal whisks, are nice to have lined in durable stainless steel, while you might prefer tin for your other pieces. It's all a matter of personal preference. 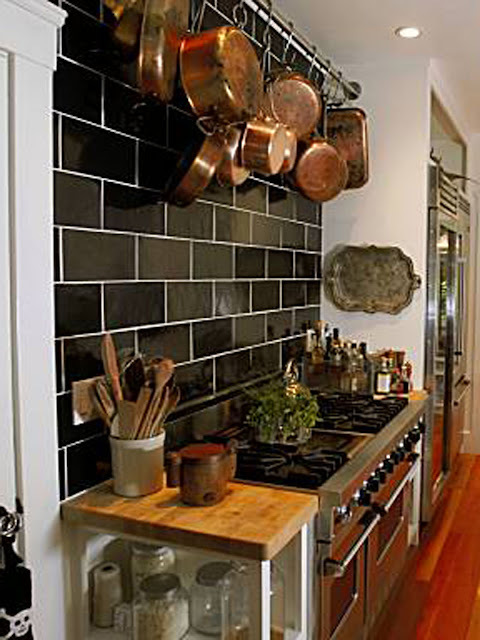 Above left: Tyler Florence's kitchen, via the San Franciso Chronicle. Above right: Martha Stewart's kitchen at Turkey Hill. This, too, is a matter of personal preference. To keep copper pots mirror-shiny requires a good deal of effort. I use Wright's Copper Cream to polish my pots and pans after every third or fourth use. Many cooks use Barkeeper's Friend, or simply a lemon half dipped in salt. Many cooks prefer never to polish their pans, and instead let them take on a deep brown patina. Whichever you do, fill your dirty copper pots with water to let them soak before washing, since scrubbing them will wear down a tin lining more quickly. Wash by hand, and then dry with a towel. Drying your pot will keep water spots from forming, which darken into tarnish. With proper care, you'll use (and love) your copper cookware until you pass them onto your grandchildren, who will probably tell you that they prefer nonstick Teflon. Ungrateful whipper-snappers! Thank you so much for this comprehensive post. I, too, have been scouting Craigslist for copper pans, ever since I bought my first - and for now only - copper cataplana - it's a special cooking pot, consisting of 2 shallow bowls and kept together by a cooper peg, much like 2 shells. I bought it in Southern Portugal, after eating amazing namesake fish+seafood dish that is a specialty of the region. I almost scored a bargain similar to yours (also not so great..it was $350 for 4 pots with lids), but didn't feel knowledgeable enough to risk that much money - and a good thing I didn't. I had no idea about the weight and 3-rivets aspects. You're on my blogroll; I always wait your new posts with anticipation. You're welcome, Tatyana - I'm so glad this post was helpful to you! I've seen those clamshell-shaped pans and wondered what they were. They're so beautiful, and I love a cooking tool that has such a special purpose - do one thing and do it well. There are definitely good deals on eBay, so keep watching. I'm actually about to bid on another copper bowl on eBay right now - the copper helps stabilize egg whites for meringues and frostings and such. My copper obsession might be officially out of control! Thanks for your comment - I hope we'll hear from you again. I bought some copper pots but I am scared they might only be for decoration. How can I tell? Some pans are too lightweight to perform especially well on the stove, but they're still safe to use. You'll find that some pans have a lacquer coating, meant to keep them from tarnishing. These pans are generally a brighter orange than the dark penny-colored copper you usually see, or sometimes only discrete areas tarnish, while the rest remains bright orange (if some of the coating has worn off). This is still safe to use, but you might try to remove the coating with acetone, which can be found at hardware stores, near the paint thinner. I love the copper! I especially love the way you've made it into art in front of your business! What a unique idea! I've found a great site for copper cookware, it's www.buycoppercookware.com. Take a look! What is your opinion on Paul Revere 1801 series copper pots and also the copper double boiler? is it worth collecting? I really don't know much about the Paul Revere copper cookware. I actually bought some as part of a lot, and I sold it off. It's thinner and lighter than I'd like it to be, but it seems to be very collectible, and it sells well on eBay. I imagine this is both because it's great-looking cookware, and made by a trusted American brand. I do have a lightweight copper double-boiler (not Revere, as far as I know), and although it's not a fine piece of copper equipment, the ceramic bottom part is nice and heavy, and it certainly does the job well enough to keep it around. Collect it if you like it! Just don't expect it to perform better than a decent stainless pot or pan. I'd check around on eBay to see what reasonable prices are for specific pieces. A reader named Chelsea emailed us the other day and asked the following questions: "What brand do you feel is the best? How much better are cast iron handles? Do you think brass and stainless are a waste?" I thought I'd answer them here. Chelsea, the only pot I own with a brand name clearly printed on it is from Bourgeat, and it's my favorite pot. I use it to make pastry creams, and I often use a whisk, which would wear down a tin lining - but Bourgeat's pans are lined with stainless steel. Most companies today line their pans with stainless steel, so that's not exclusive to Bourgeat. I have read a lot of good things about Falk ( http://www.copperpans.com/ ) on Chowhound forums, too - they have a brushed exterior, which means you don't have to worry about dulling the surface when you're cleaning them. Most new copper cookware will have curved, no-drip edges. I would look around on eBay and look for very heavy, thick pots (ask the seller for the item's weight, and then compare it to Falk's website), rather than focusing on a brand. And if I buy any more pots, I'll probably buy stainless-lined (newer) ones. As far as the handles, cast-iron usually just indicates a heavier pot. A thin brass handle means it's attached to a lighter-weight pot - so look for cast-iron instead. Copper isn't worth the extra money if it doesn't have the heft to heat up quickly and retain heat. And brass handles will heat up faster than iron. I hope that helps, Chelsea! I recently purchased an array of copper pots and pans, I would like to know more about some of them. Could you tell me about a double boiler that I have that is fluted at the base and is stamped Waldow, Bklyn, New York. Some of my pans are stamped William Sonoma, are they considered to be Mauviel copper pans? Some are hammered and do not have a stamp at all. I look forward to your response. Christine, You described several pots in my kitchen. I have the Waldow double boiler and the W-S stainless lined Mauviel pots. I also have a hand-hammered Mauviel pot with a cast iron handle. All are excellent pots, though I have never used the double boiler as anything more than a decoration. My wife is a professional confectioner and she uses the hand-hammered pot for her business. (It's my job to keep it clean.) In any event, all those pots sound like keepers. Enjoy! I have a collection of Mauviel 250c. That is the thicker more expensive line.I love the weight and the look of the thickness. It is very frustrating to me that they do not engrave the bottom.They make some of the same pieces in the 250c (2.5 mm) and 150c (1.5 mm) lines,the 150c is less expensive obviously.So,if you were looking at the same size sauce pan or saute pan side by side of 150c and 250c you could not tell them apart if they had the lids on.Most people would not be able to tell 1.5 mm from 2.5 mm. When it arrived,I did use calipers to be sure I got the correct thing. WHY DONT THEY ENGRAVE THE BOTTOM !!!!!!!!!!!!!!!!!!!! 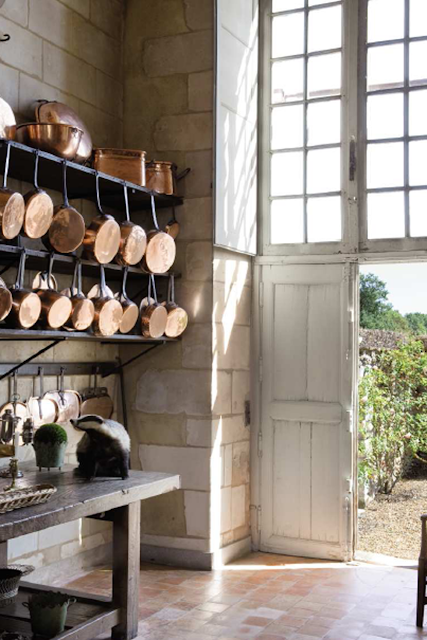 I love my copper pots and pand, but somehow I find myself with too many escargot pans (that's what I was told they are). Do copper collectors ever trade more traditional cookware for such oddities? 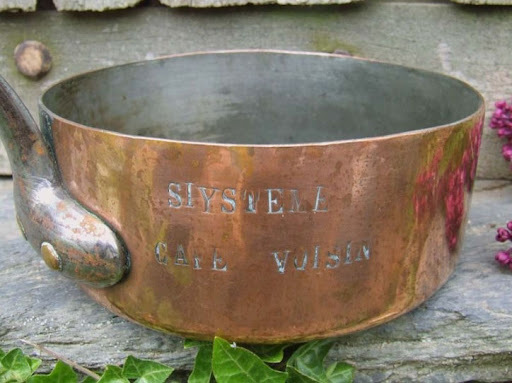 Does anyone know anything about METAUX OUVRES-VESOUL's copperware? What worthwhile minumum standards should (us) collectors look out for? I have a set of Progressive pots made in Korea. Any information? 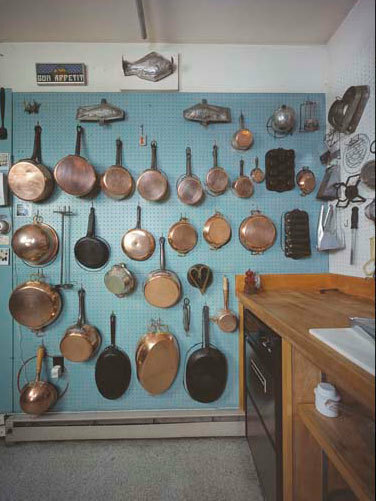 Thanks so much for a wonderful article on copper cookware! I am envious every time I see the opening of Downtown Abbey. Kim - I know! I completely agree. I've looked for pictures of the DA kitchen online, but haven't found a good one. If only I had an army of servants to polish all the copper, too. I recently purchased a nesting set of sauce pans with cast iron handles and three rivets. They are incredibly heavy and have two stamps on them. One is Made in France and the other is Design Store France. I have not been able to find any information on this maker, as far as quality, age of pans, etc., nothing online about Design Store France. The rivets have numbers on them on the inside of the pans. Have you any knowledge of this maker? Hi! Unfortunately I'm not familiar with Design Store France - but your pots sound great. I think there have been so many small, no-name, but high-quality makers of copper cookware, over many years, that it probably doesn't mean much if you can't find anything online about them. I hope you enjoy them! I have a set of heavy copper pots that are marked "666" France. Any info on these pots? 666 France I believe was sold at a store in New York, I have one or two and looked it up. That is the store Bazar Francais in lower Manhattan and frequented by Julia Child and Dione Lucas. The street number was 666. But dont remember which street. They closed in the 1970s. Pots were made in France. I just uncovered 3 copper pots in a storage unit that I must have purchased some 30+ years ago. They are by Copral, made in Portugal. Do you know of this brand? Do you know if it is high-quality? From your comments I see that the thicker the copper the better. These pots have a rolled edge. Any info on these? Thank you. Hi! At a neighborhood estate sale, I stumbled upon a beautiful Waldow copper chafer set with 8 different pieces, tin-lined, wood handles. I found out it is circa early 70's. Also a copper Waldow frying pan with wood handle and tin lining. I have down-sized my life--including my kitchen--and really don't have room for this, but I thought it was beautiful so I bought it anyway. I feel I should sell it to someone who will appreciate it. Any idea what something like this is worth? I see nothing like this set on eBay. If there's a greenish tint don't cook in it! 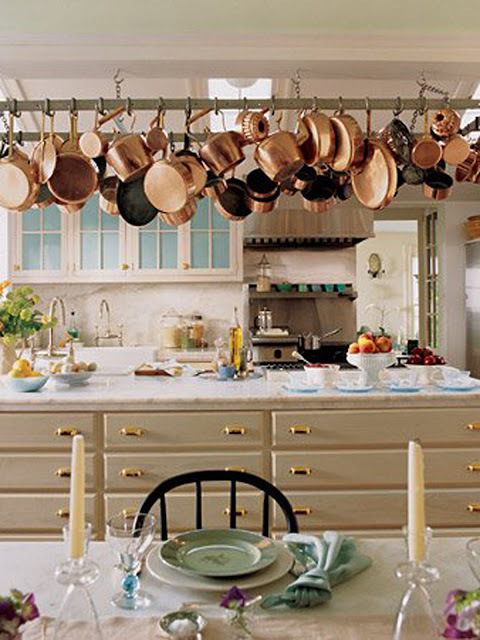 Copper pots need to be lined with tin or stainless steel to be safe for most uses. If it's greenish, it's probably because the tin lining has worn away and copper is exposed. Copper turns green when it oxidizes. You can have the pot retinned by a number of services (there are many good ones that do it by mail and some local ones may exist too for you). Once it has a new lining, it should be good to go. The tinker can give you advice on using. Don't cook in it now though if it has any green stuff on the inside! I have unpacked two copper skillets recently that I have had for years. They belonged to my mother who had a collection. They are heavy and the larger one has a 28 stamped on the upper part of the body and also numbers stamped on the bottom side of the handle. Unfortunately I cannot use them for cooking because the metal seems corroded by bumps and tarnish. What to do with these two?